Per serving: 190 calories, 54 calories from fat, 6g total fat, 1 g saturated fat, 35mg cholesterol, 330mg sodium, 20g total carbohydrate, 1g dietary fiber, 6g sugars, 14g protein. Preheat the oven to 350Â°F. Coat a nonstick mini-muffin tin with natural butter-flavored cooking spray and press a wonton square into each cup of the tin, forming a wonton cup. 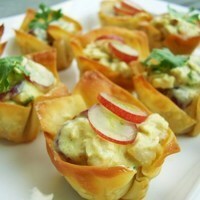 Lightly coat the wonton cups with cooking spray and bake for 12 minutes or until golden brown. Let cool in the pan. Meanwhile, in a medium bowl, stir together the chicken, yogurt, mayonnaise, chutney, curry powder, and salt. Then add the celery, grapes, and cilantro and stir. With a spoon, stuff about 2 tablespoons of the salad into each wonton cup. Garnish each with a tiny sprig of cilantro or a red grape sliver, if desired. These wonton cups are very attractive and the ingredients sound tasty. I haved added the recipe to my Try Soon folder. I like the use of celery and grapes to mix up the textural component of the dish. The curry and mango chutney make a nice flavor blend as well. Thanks for sharing!